Good morning and happy Friday!! This week has been (rightfully) non-stop work, aka the post-vacation avalanche of a million “things that need to be done.” A few weeks from now though, this crazy week will have been forgotten and I’ll be looking to plan ahead for our next vacation. Is there a name for that? Post-vacation work amnesia? Hope you had a wonderful week! Back tomorrow with another outfit post! I’m loving this trend, you wore it nicely. Perfect with the leopard touch! I’m loving the pops of leopard. It’s subtle yet makes a statement. And this color is GORGEOUS! 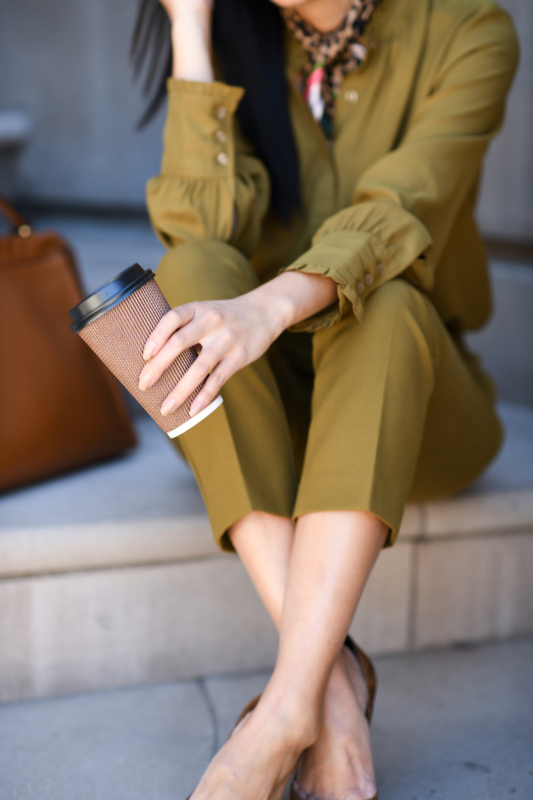 Love the color palette of this outfit – this mustardy-green / olive color is perfect for fall dressing! And aw I hope things at work start to get better!